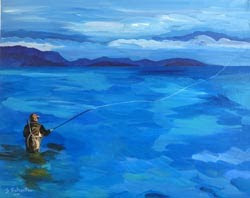 This painting was inspired by a photograph taken of a fly-fisherman enjoying his day at Nile Creek in Bowser. I started worked on it during one of my paint days at TOSH (The Old School House) in Qualicum Beach. People come and go in the gift shop, looking at jewelery, pottery and nifty art to either take home as a souvenir of their stay in Qualicum, or to buy for themselves. One particular couple were in the shop, the wife content on looking at every single item, while the husband was dragging behind. Obviously he would have rather been anywhere else. They were just about to leave when the wife said "Oh, I just want to look at one more thing." He shuffled his way over to see what I was doing, and with excitement said "Oh, you're painting a fly-fisherman". Well let me tell you, his mood totally changed. For the next 20 minutes he passionately told me the merits and pleasure one gets out of tying their own flies. Funny thing is his wife was now ready to leave and she practically had to drag him out of there. Art is in the eye of the beholder!